That’s Giroud; of course, that I am talking about for those who may have been wondering over recent weeks what FFP stands for. On he bounded looking determined, rested and raring to get goals and that is exactly what he did. With his first touch of the game he put us back ahead and then shortly after with just his second touch he scored again this time from a corner, powerfully guiding the ball over the keeper’s out stretched hand. Smiling from ear to ear he knew that he had saved the day and the thought crossed my mind as he reeled away in celebration knowing he put the game completely out of Sunderland’s reach that the only thing missing from this picture was a Superman cape with the letters FFP on the back. Welcome back Ollie you have been missed. Arsenal’s training session in the North East in preparation for next week’s North London Derby went exactly to plan. Arsene Wenger was able to completely rest Özil who surprisingly didn’t even travel and bring Oxlaide-Chamberlain in for Walcott and Gibbs for Monreal giving the two regulars an extra week to recover, again in preparation for next week, although, it took very little time to see that there really isn’t a lot of difference between all four of them. Oxlaide-Chamberlain and Gibbs are able deputies and both highlight the depth and strength of the squad. The Ox started confidently, buoyed by his two goals in mid week against Reading; it was his excellent cross that Sanchez headed home to get us off the mark. This goal was on the back of a twenty-one pass move but although Sanchez still had a lot to do when the ball came in the star of this show was the quality of the cross. It is made all the better when compared with some of the crosses Alex has sent over this season which can only be described as somewhere between bad and woeful and so when he shaped to send in what turned out to be a thing of beauty I feared the worse but fear I needn’t have because boy did he deliver. Well done young man. Shortly after Gibbs and he dispossessed a Sunderland player by their corner flag, Ox ran in and shot from the most impossible angle when Iwobi and Sanchez were waiting on the 18 yard line. Iwobi put his hands in front of him to indicate where he had wanted the ball played and Sanchez threw his hands in the air in frustration. Alex glanced guiltily at the bench, aware of his school boy error and from then on his confidence slowly waned and he gradually drifted out of the game until he was subbed in the second half. As we all know we should have put this one to bed a lot earlier but we were clearly lacking a killer instinct. Özil as I said didn’t travel, Iwobi is just too nice; he is the kind of boy you would be happy to meet your mum; he needs Ian Wright to take him under his wing to teach him just how to be more of a selfish, fatherless person. Apparently Wenger commented in the week that he thought that Iwobi is trying too hard in front of goal, suggesting he needs to relax more, gotta agree with that. It wouldn’t surprise me if he gets a bit of a rest now, starting on the bench mid-week as well as the coming weekend as more of the Cav return namely Giroud. Sanchez will probably move out to the left to replace our up and coming Nigerian star. And on that subject, Sanchez was a bit like a one of those super dooper Swiss Army Knives which is able to do anything and so is he. The problem is that there is such a great deal of choice you have to take time to consider which tool would be the most appropriate for the job in hand and so with Alexis; he is so multi talented that the possibilities available to him are so much greater than other players and because of that he often takes more time than necessary which usually involves trying to beat one more player than is needed when more often than not a simple pass would be more effective. Sunderland were poor but even so they still managed to give us a scare when the referee’s selected decision making ignored the fact that Sanchez was being pulled back in the Sunderland box which should have been a penalty to us but five minutes later he had no problem awarding one at the other end which Defoe put away to level the score. It was all set up for Giroud and he wasn’t going to waste this chance to show everyone what they had been missing. Ramsey reappeared amidst the celebrations of Giroud’s first and it immediately became apparent that he is so much more than a box to box player. Elneny is a box to box player and while I am on that subject he deserves special mention for the calm, controlled performance that he put in today. The Egyptian will run from the edge of our box to the edge of the opponent’s box but will rarely go in. Watch Ramsey, by contrast, he can run from box to box with the best of them but notice in the short period that he was on yesterday how many times he glided into Sunderland’s box adding to the attacking threat. In fact he played a part in the fourth goal when Gibbs hit the post and Ramsey played it onto Sanchez whose nimble feet seemed to dance on a sixpence before he poked it past their helpless goalkeeper. Job done, game over, banana skin avoided, Sanchez was my man of the match, sometimes he can be frustrating but that is only because he offers so many possibilities. Moving on, oh how I am looking forward to next weekend, it would have been a bit of a shame if spuds had lost to Leicester, shame in the way, that is, that it would have taken some of the shine off next week when we inflict their first loss. This entry was posted on Sunday, October 30th, 2016 at 10:26 am and is filed under Uncategorized. You can follow any responses to this entry through the RSS 2.0 feed. You can leave a response, or trackback from your own site. I can imagine the look of pure joy on your face as you wrote this. Sanchez is the extra size Swiss army knife. I think him trying to do it all himself comes from playing in the Chillean side where he hasn’t got teammates to delegate to. Awesome character, I really like him. Sanchez was the Chilean jumping bean, Giroud came back with bigger balls, Oxo is still marmite and we didn’t miss Ozil at all. I thought my memory was failing me and checked the team yesterday. He was there all right, looking very tired after 60mins, but still brilliant. what is LB playing at? Did anyone else notice Giroud asserting his goal scoring place over Sanchez. After Giroud scored his second, Sanchez took the ball down the wing but didn’t pass or something. Giroud got pissed and told him off. Sanchez then goes on to scores his second later on. I just got the impression that with 2 goals scored so quickly, Giroud was almost telling Sanchez to get the ball to him and not for Sanchez to do it all on his own. I was going to watch it again and specify the minute it occurred however my son is watching a movie and won’t let me. Hmm, maybe I should assert myself, nah, he’s stronger. VP. I hope what you saw was correct, to have two CF’s both scoring is just what we have been asking for. Add in Welbeck and Perez and we have great attacking potential. Wow – difficult to fit all the build-up to that Arsenal goal in one GIF! Ozil was pretty much anonymous throughout the game. I think it was Mesut’s twin brother who was playing. Eddie/Chas, I did my left knee in 60 years ago during a football game. Back then an operation would have meant having a stiff leg for the rest of my life – so I chose not to have surgery. Over the years it has popped out of joint on numerous occasions and I do a back mule kick to get it back in joint – not as painful as it sounds. I backed out of knee replacement surgery in June as it would have kept me incapacitated for 3/4 months. What I’m saying is that if the knee is strapped up or in an elasticated brace it shouldn’t be an issue limping to the ground and seating makes it easy during the game. That was a wonderful game report LB – you add another dimension with your thoughtful analysis. Who was that player disguised as Ozil? Chas, the only danger is if you dislocate your knee again under the full weight of your body – going down stairs being one of the worst examples. But frankly if it’s a persistent problem for you then a knee replacement would be a good idea. Given you are a lot younger than myself your recuperation period would be a lot quicker. A little bit more difficult than expected. Lesser teams are going to see that putting in an honest days work might get them a result. Hopefully we can cut that crap out asap. Good to see the final result so decisive. Also good to see so much depth. The one place i still think about is if we lost ozil for a period who would replace him. Iwobi seems to be hitting a wall for the moment. Immense talent but did little yesterday. We’ll learn much more about this team in Nov. Three big matches starting next week. Not sure whom I like less Villa or B’ham. wally. With Santi, Xhaka and Ramsey back in harness the pain of losing Ozil would be eased. Love the Swiss army knife analogy for AS as long as one of the ‘functions’ is a tiny drum. Sanchez sets the attacking beat of the team and leaves others no other choice than to follow his lead. That is a super quality of him and very important for the team. Elneny was the epitome of midfield efficiency and doing the simple things to great effect; as a result we bossed the midfield and were a lot more solid on our vulnerable left side. And yes Gibbser played very strongly too: has he finally become a man? I had completely forgotten about Asano………..well taken goal. BR, I’m aware of who the options are and really it’s only santi. But he’s getting on and getting knicked up more often. The other two? Not really. Yes they can play the position (coquelin could too) but not even remotely in the same class as ozil. Neither can pick the finishing pass like santi or ozil. Fine match report LB, justas I saw it really. There were a couple of things that made me question Sunderlands preparation of the surface…..one the amount of ball through air passes we played, secondly the bounce for Ozil’s lob miss, the ball stops like Alexis our backspin on it. And was playing a lob wedge into an Augustus green, similarly the way the ball didn’t sit nicely for Ox when he went through. TA and Ant were at game so wondered whether they noticed a distinct lack of sprinkler use pre match. GiE, it was warm for the time of year at the SoL and the pitch looked very, very good from above. There was no sprinkling indeed so the surface will have been relatively hard and bouncy. wally. There is no argument from me, I simply point out that we have options. BTW As an England cricket fan, this morning was a black few hours. TA doesn’t surprise me, Moyes is out of the old school, like Pulis and Allardyce, they’d rather run a plough down the pitch in the week prior when playing teams like us and City etc. The AA comments clock hasn’t gone back. Doesn’t matter, simply an observation. aha, Didit is back, goodie! Presumably other sides at the tight top will also rue the same amount of missed points. No-one was likely to win ’em all. and ‘From The Jam playing dec ‘ ???? I give up. What is the Jam playing dec??? losing games to poorer opponents is never acceptable. Leicester showed us last season how every point counts. They were not much more than consistent throughout the season. I was hoping that we can do the same, not slip ups from the start to the end. Of course we would lose games – better opponent, bad hair day for us, dodgy ref and we lose a game or two. But throwing away games is criminal. In every faltering relationship, there is a pattern: Everything they originally loved about you is now deeply, deeply irritating and indicative of your massively flawed personality. Your independence was once endearing but is now a bone of contention, while your sarcasm has plummeted from the highest to the lowest form of wit. And so it is with football. The strength you loved soon becomes the weakness you hate. Everybody loves possession until it becomes sterile. Everybody loves passing football until it goes nowhere. Everybody loves aggression until the cards turn red. Everybody loves a red-hot striker until their team becomes over-reliant. Everybody loved Arsenal’s stunning one-touch passing football until we all started screaming “stop trying to walk the ball into the bloody net”. Where football differs from most relationships is that the situation can be rescued; the process can be reversed. This Arsenal side reminds us of everything we once loved – and then found massively, massively frustrating about them. We’re in the honeymoon period again. 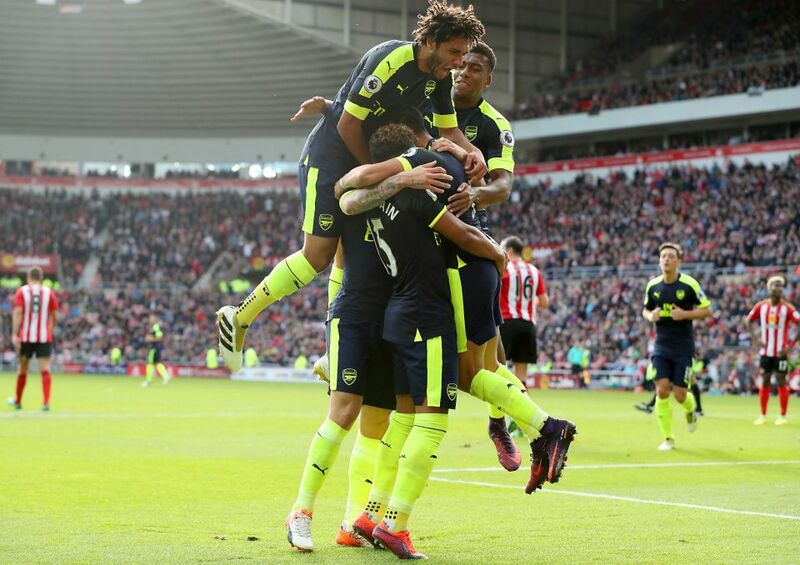 There is the caveat of this Sunderland being one of the worst sides we have ever seen in the Premier League but that Arsenal opener…wow. Nine outfield players involved in a 22-pass move that culminated in a striker’s finish from a diminutive non-striker. It was so smooth, so incisive, so unchallenged that it looked like a training exercise and yet nobody claps at the end of a training exercise. I did, entirely surprising myself and the cat. There should have been more goals in an entirely lopsided first half that showcased the beauty of this Arsenal side, with their ridiculously offensive full-backs, the desire of Sanchez to hunt down the ball, the new-found confidence of Alex Oxlade-Chamberlain and the refreshing hunger of Mesut Ozil to move beyond his ‘striker’, who is more than happy to make room. It looks lovely and we like it when football looks lovely. There was a blip of course but Arsenal’s reaction to that blip was ruthless, giving weight to Sir Alex Ferguson’s observations this week that these Gunners are more ‘sturdy’ than previous incarnations. 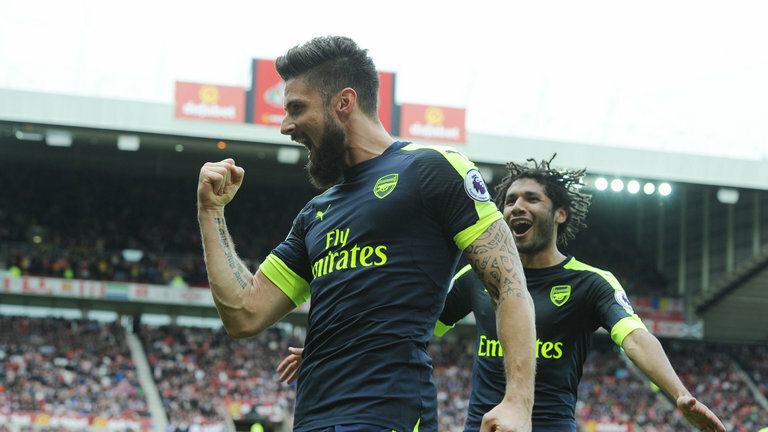 Plan A had produced one sumptuous goal but a Plan B was required; Olivier Giroud came off the bench, Sanchez moved wide again and Sunderland were destroyed in seven uncompromising minutes. We wrote that Arsenal quite possibly have the best squad in over a decade and it’s telling that the XI who started against Sunderland contained only five players who featured in over 2000 minutes of Premier League football last season. The Gunners have a raft of injuries and yet the replacements – Oxlade-Chamberlain, Kieran Gibbs, Mo Elneny – were all seamlessly excellent. Meanwhile, new signing Shkrodan Mustafi has added the kind of leadership and composure that makes us repeatedly check his date of birth and shake our heads in disbelief. That Giroud could score 16 Premier League goals one season and be Plan B the next is a wonderful omen for everybody at Arsenal but the Frenchman himself. That he then came off the bench and scored twice is a wonderful omen for everybody bar none. First they made pretty patterns and walked the ball into the net. And then – when required – they were quicker, more ruthless, more direct. After 20 years of marriage, it might be time for a renewal of vows because love has blossomed once again. Some of us never fell out of love for Arsenal, most who did are now in love again – and then there’s Eddie sitting uncomfortably on the fence. BR, I left home at 17 but I think the average leaving home age nowadays is 33. He has a bigger TV in his room but no Netflix. So I waited until his movie finished and fell asleep. Later I checked and it was much less than I remembered it being (remember that the game is played In the middle of the night here). On a worse note, I fell asleep with Chas’s knees burned into my memory. There should have been a warning to look away. Thanks for posting that piece from Sarah Winterburn, it is an excellent read. Oh I wish I could write that fluently but then again we can’t have everything. I will just have to settle for the reassuring knowledge that my love is not as fickle. OK, I admit it, Eboue on the left wing was a bit trying. Happy you enjoyed it LB, I find it reassuring that others continue to share my level passion for Arsenal. After close to 70 years of watching them along with all the highs and multiple lows my personal passion has never varied. The average and poor seasons have far outweighed the good but that is what one should expect from our sport. If results were all predetermined there would be no excitement or anticipation or sport involved. Frankly one of my biggest disappointments has nothing to do with our teams performances and it has everything to do with the disgraceful treatment that Arsene Wenger has had to endure. Lovely to see Didit’s return from half-term hols. chas. Don’t listen to anyone. Find the most expensive solution, after all, do you want an Ozil/Sanchez remedy or a Lucas Perez? So what happens if Gibbs gets and injury, does Maitland-Niles (Conservative) play there? One extra day rest more than Totnum, albeit they’re at home. Still, I’d take the extra day. Wozzup with Theo and Santi, and are we expecting 20 mins from each tomorrow ahead of Sunday? Get out of here ….. we are playing tomorrow??? I bet the squad’ll make a special trip to see the clock tower in Razgrad. That fixtures talk reminds me of when Micky used to base his match day planning on the fixtures list on this site which used to be put up at the start of the season and then never changed! I’ve emailed you a new post – it is time sensitive and should be used either Thursday or Friday this week. Ant – micky is intolerant of changes and anything new, proper old school. does it matter if we just draw tonight? Is the game televised at all? Arsenal and Paris St-Germain both have seven points at the top of Group A – Ludogorets and Basel have one point. Yesterday I saw some calling for Wenger to play the strongest possible team to ensure qualification. It's great here, the beer is very cheap, I love the trams, people very friendly if a bit foreign. That's my away-fan blog, thanks god bless. Mel on twitter takes the pee out of those posting updates on their trips away to see The Arsenal. I went skiing in Bulgaria once. it was ok, nothing special. Cheap it was indeed. Croatia and Poland best of the ex Commie countries. Mesut Özil has been in relationships with Melanie Rickinger (2014 – 2015), Mandy Grace Capristo (2013), Aida Yespica (2012) and Anna Maria Lagerblom (2009 – 2010). Let’s face it, he’d be crazy not to want ‘an encounter’, if one was on the table. 7.28 Sophia pic has led to a lack of focus on today’s PM. Magnificent. Do we know anything about this, is it serious? He’s very valuable and being rested. I love those Mel O’Reilly posts, very clever and very funny. Need a punchy title. Please. Come on. I have had just one suggestion which , quite frankly, was crap. Or………. We really don’t expect too much trouble from Ludagrets so I have decided to rest Hector, feed him solely on red meat in preparation for Saturday. Will Ramsey and Giroud start hmmmmmm. Well we know that Sanchez and Ozil will start it is in their contracts. So it might be possible that Sanchez is subbed early in prep for Saturday and Giroud gets some more minutes at the end. Should be interesting this one. Let’s get this one over with as quick as we can and move onto Saturday.